An 11-year-old girl from Montgomery County whose mom has spent almost a month out of work as a furloughed federal employee created her own business to help her family and others. (NEW YORK) — An 11-year-old girl whose mom has spent almost a month out of work as a furloughed federal employee created her own business to help her family and others. 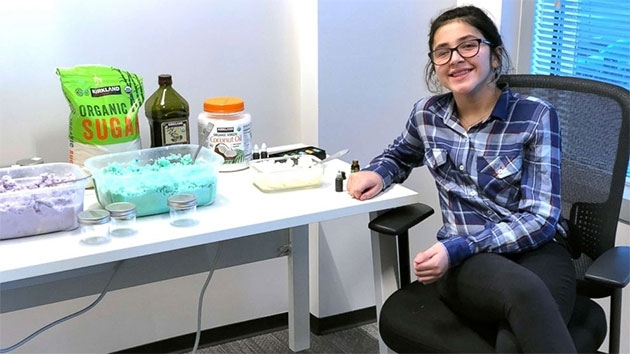 Bella Berrellez, a fifth-grader in Gaithersburg, Maryland, has sold more than 500 of her handmade sugar body scrubs since the federal government’s partial shutdown began last month. She started making the $7 creations when her mom, Jessica Berrellez, a longtime employee of the U.S. Food and Drug Administration (FDA), was furloughed. “I just came up with the idea because when I found out my mom was furloughed I was like, ‘What can I do to help?’,” Bella told “Good Morning America,” noting the sugar scrub business is her third start-up, coming after her earrings and slime businesses. A stalemate between President Donald Trump and congressional Democrats over funding of a wall along the U.S.-Mexico border has created the longest federal government shutdown in history, and forced over 800,000 government employees to go without paychecks. Bella started Bella Sweet Scrubs using a recipe she and her mom used to make body scrubs during a day they spent together in December. She began by selling the scrubs to neighbors and friends and now has her own store on Etsy, where she ships them to customers across the country. Bella, who is partially blind, is using her profits to help grow her company and help others. She recently donated $100 to Nourish Now, a nonprofit organization that collects food from donors like restaurants and cafeterias and distributes it to families in need. Bella’s donation will allow the charity to hand out an additional 200 meals, according to Brett Myers, who founded the Maryland-based charity in 2011. Bella learned about the shutdown because she watches the news every morning while having breakfast, according to her mom. The family has since had discussions about how they are affected and how they can help others. Though the Berrellez family is able to get by during the shutdown because they are a dual-income family, Bella’s business has provided a “positive, fun distraction” during the long days of uncertainty. Bella’s mom said her daughter’s entrepreneurial pursuit has made her realize how aware children are of what’s going on around them and how much they want to help. “All I think is they should reopen the government because I want my mom to go back to work,” Bella said.